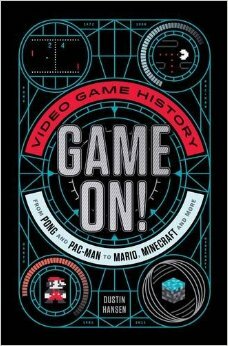 As the cover tagline says, this book is a “Video Game History from Pong and Pac-Man to Mario, Minecraft, and more.” It starts at the beginning with the original arcade games, moves to home gaming consoles, and then onto the first text adventure games, and… wait! Text adventure? What’s that? 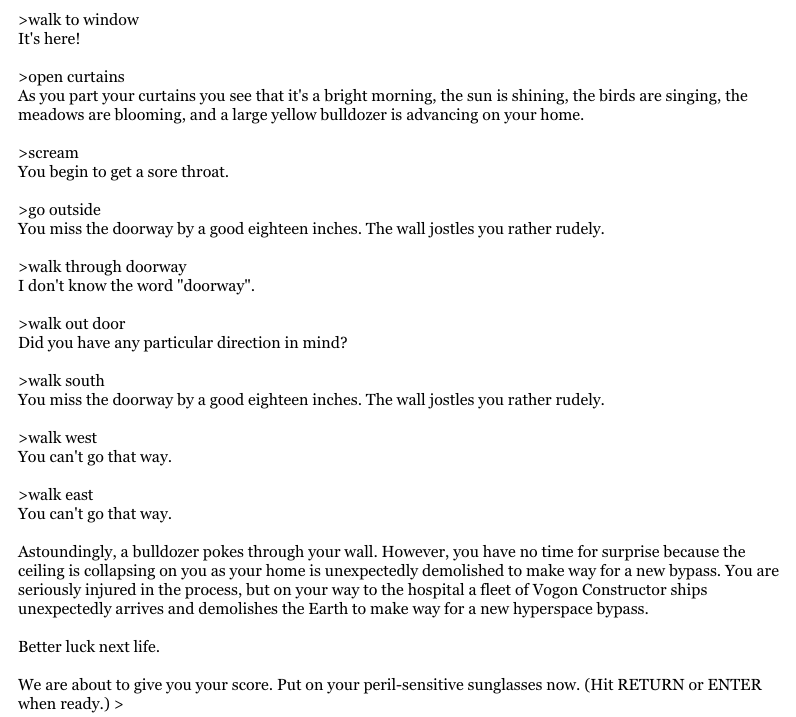 For those of you who are as out-of-the-loop as I was, a text adventure game is just words on a computer screen — no pictures, no graphics, just text and a blinking cursor where the player types what to do next. 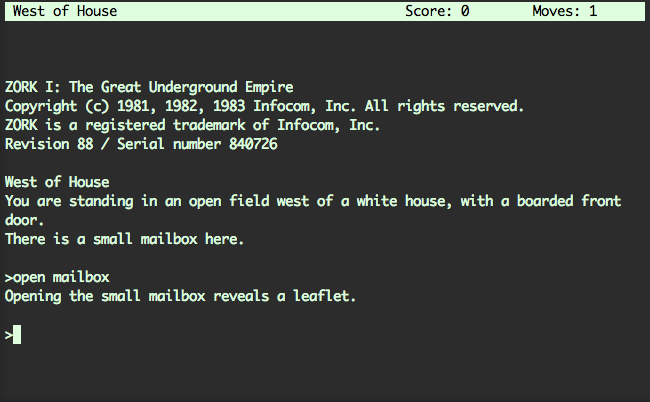 I wanted to play Zork because, according to the author of GAME ON!, this is the text adventure game that popularized the genre. It wasn’t the first (that credit goes to Colossal Cave Adventure from 1976), but Zork had the advantage of being released in 1980 during the advent of the home PC. (Personal computers existed before the 80s, but they were so damn big that pretty much no one had one, so I’m not counting them.) 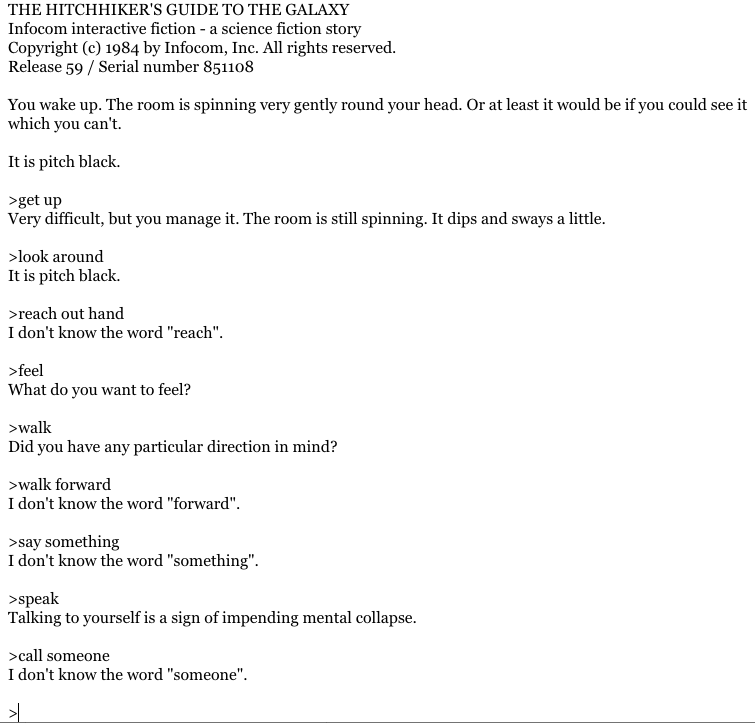 However, I couldn’t find a playable version of Zork, so I played another of Infocom’s big text adventure games, The Hitchhiker’s Guide to the Galaxy. I type in a bunch of stuff and hope the computer recognizes the words. At least when I’m wrong, it often writes something funny back. But it can also be super frustrating. Especially when I can’t figure out how to get out of the first room! 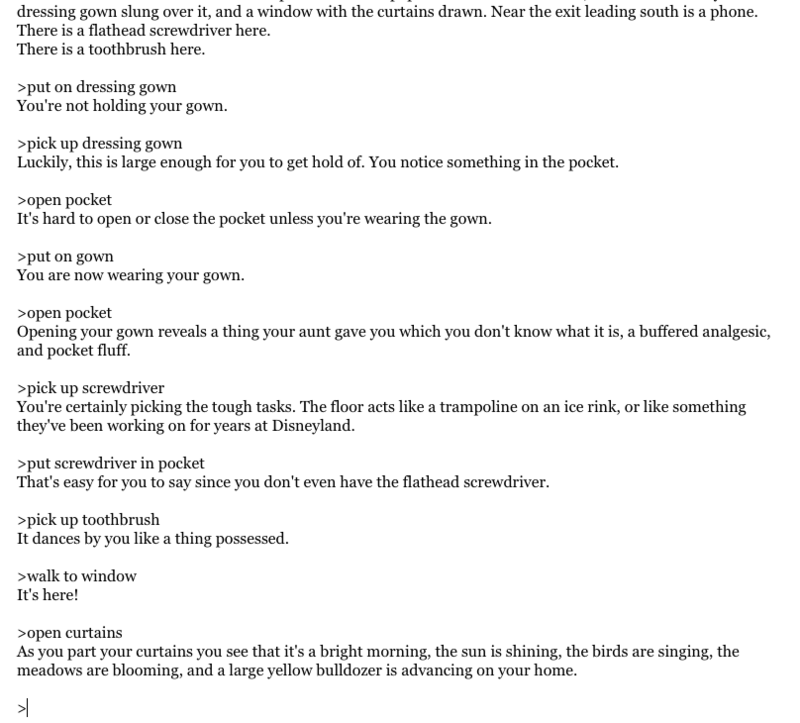 So, as a writer, what did I learn from playing my first text adventure game? 1) STAKES are key. In Hitchhiker’s Guide to the Galaxy, you can die in the very first scene! Talk about getting right into the action! 2) ENTERTAIN the player in every scene, or they won’t come back and play again and again and again. This is especially necessary because the player will often have to replay a scene before they figure out how to move on. So use jokes and hidden messages and easter eggs to make a replayed scene more fun. 3) REWARDS, both big and small, are necessities. What does the player get out of this? This question seems easier to answer with games because the main character is YOU the player and you’re on a quest to win through small victories (rewards) throughout the game and a big victory at the end. But rewards are important in all forms of storytelling. Playing Hitchhiker’s Guide reminded me to always think about what the audience/reader/player gets out of the story. 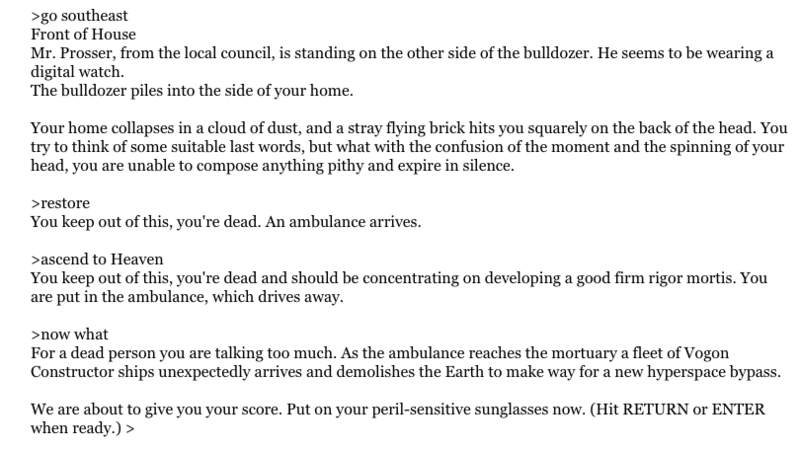 That said, my Adventures in Interactive Fiction do not end with Hitchhiker’s Guide to the Galaxy. Oh no. Once I started, I found more games to play, and then my friends shared their favourites games, and I started learning all kinds of stuff about narrative games. There is so much out there! But that’s a post for next time. Until then, if you’re interested in learning more about interactive fiction, here are a couple places to start: Winners of the 2016 Interactive Fiction Competition and The Interactive Fiction Database. Do you have experience writing or playing interactive fiction? If so, what are your favourite games? Let me know in the comments. Hi. I would really like some advice please. I am being commissioned to write my first Interactive Fiction story. Could people please share with me the average amount that is usually paid for these stories? the dev has told me to name my price, and I confess I have no idea what is normal. Thank you. I write a series of text adventures called Crypt Shyfter on Newgrounds. I just posted the 8th installment today 🙂 I love writing IF! I’m taking a coursera.org course called Story and Narrative Development for Video Games https://www.coursera.org/learn/video-game-story/home/info You might want to check it out. It’s free if you don’t care about getting feedback on the assignments. Cool! I’ve heard a little bit about MUDs but haven’t played any yet. I’ll have to check those out too. Thanks, Rick! Having played and programmed interactive fiction like Zork (1,2&3), plus Hitchhiker’s, I consider the epitome of the genre to be the tabletop and now virtual tabletop games, such as Dungeons and Dragons or Pathfinder. A leader, game master, leads other players through the adventure using a written text description. See D&D on the Wizards of the Coast Web site and virtual tabletop on Fantasy Grounds .com. I am now just dipping my toe into writing my first vitual table top adventure. Awesome! Thanks for the recommendations. I’ll definitely check those out. And best of luck writing your first virtual tabletop adventure game!